John Anderson submitted this photo and caption. 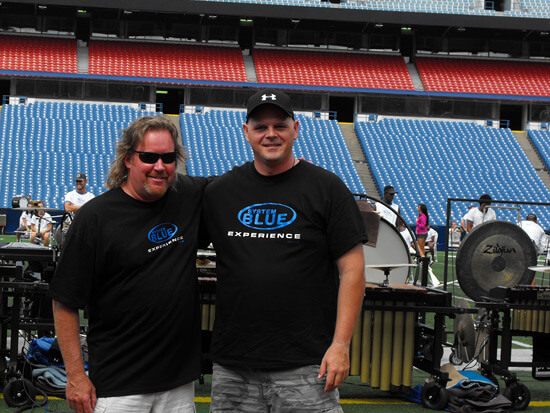 I was fortunate enough to attend my first DCI show since 2001 in Buffalo, N.Y., on Aug. 2, 2009. The Blue Devils were the first World Class corps I ever saw when I started marching back in 1981 with St. Andrew's in Cambridge, Ontario. Being able to attend the System Blue Experience and getting to drum with the Blue Devils snare line was the thrill of a lifetime. Blue Devils percussion caption head Scott Johnson (Sco Jo) was also kind enough to strike a pose with me which topped my day. Thanks for the memories Blue Devils!